German luxury car maker, Mercedes-Benz is looking to foray into mid-range segment of cars in India, taking the premium brand of Mercedes to the masses in India, a top company executive informed on Thursday. The new models of mid-range cars are expected to be launched over a period of next two-three years. "We are positively considering to enter into mid-range segment of cars in India over the next two-three years. "This will help us take the Mercedes brand to larger masses and increase our sales in the country," said Peter Honegg, managing director and CEO, Mercedes-Benz India, the Indian arm of Mercedes-Benz. "The proposed mid-range cars will be priced below our C-Class variant, which is currently the cheapest model offered by the company," he added. The company sells C-Class model at Rs 28 lakh or Rs 2.8 million (ex-showroom Delhi). These mid-range segment cars will be completely knockdown units and will be assembled at the company's existing facility at Chakan, Pune in Maharashtra. Currently, C-Class constitutes about an average 35 per cent of the company's total car sales in India. 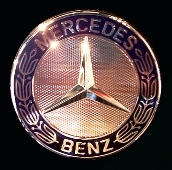 Mercedes' passenger car sales have shown sharp growth of 35 per cent (year-on-year) during first nine months (January to September) of the calendar year 2011.
units registered in the same period last year. "September month has been the best-ever period for company's sales. We sold 745 units during the month up by 12 percent in the same month last year. "We are hopeful to see this year as one of the best for the company so far with sales of about 7000 units by the year-end," said Honegg, who was in Ahmedabad for the launch of a dealership. However, commenting on the interest rates and fuel price impact on luxury car sales, Honegg said, "It's getting bumpy for luxury cars now as the fuel prices have increased and interest rate hike is also not helping in sales. The pace of growth may slow but in long term, we see India becoming world's third largest car market in next ten years." Gujarat stands seventh in the company's total business generation with about 7 per cent share in the total car sales. In Gujarat, the company had sold about 400 units in 2010, while the number is expected to rise further in the current year. Delhi and Mumbai are the top two markets holding a combined 45-per cent share in the total sales.